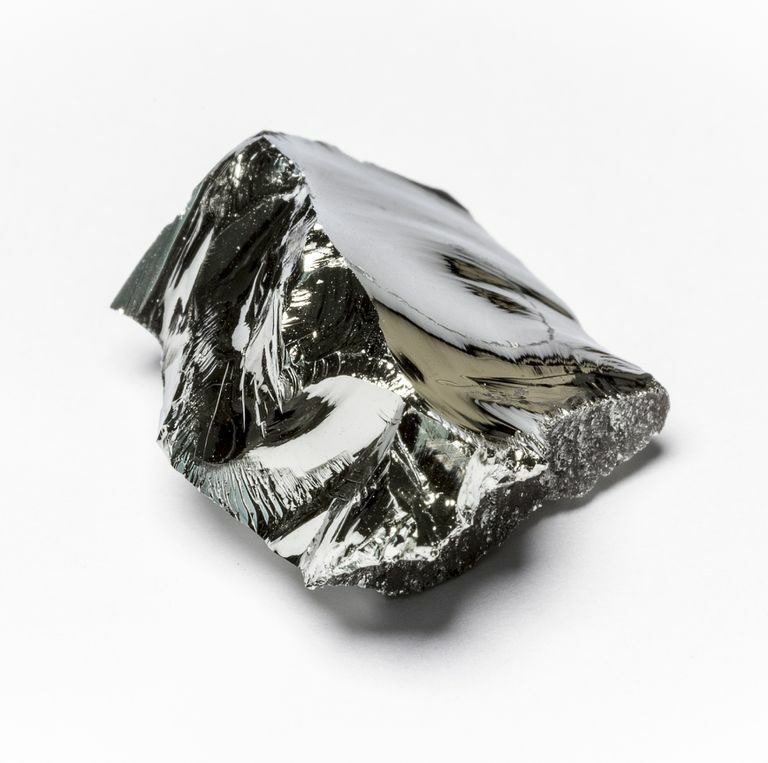 Germanium is a gray-white element with a metallic luster. Gemanium is a shiny grayish-white metalloid with a metallic appearance. The element is best known for its use in semiconductors. Here is a collection of useful and interesting germanium element facts. Properties: Germanium has a melting point of 937.4°C, boiling point of 2830°C, specific gravity of 5.323 (25° C), with valences of 2 and 4. In pure form, the element is a grayish white metalloid. It is crystalline and brittle and retains its luster in air. Germanium and its oxide are transparent to infrared light. Uses: Germanium is an important semiconductor material. It is commonly doped with arsenic or gallium at the level of one part per 1010 for electronics. Germanium is also used as an alloying agent, a catalyst, and as a phosphor for fluorescent lamps. The element and its oxide are used in highly sensitive infrared detectors and other optical devices. The high index of refraction and dispersion of germanium oxide has led to its use in glasses for use in microscope and camera lenses. Organic germanium compounds have a relatively low toxicity to mammals, but are lethal to certain bacteria, giving these compounds potential medical importance. Sources: Germanium may be separated from metals by fractional distillation of volatile germanium tetrachloride, which is then hydrolyzed to yield GeO2. The dioxide is reduced with hydrogen to give the element. Zone refining techniques allow for the production of ultra-pure germanium. Germanium is found in argyrodite (a sulfide of germanium and silver), in germanite (composed of about 8% of the element), in coal, in zinc ores, and other minerals. The element may be commercially prepared from the flue dusts of smelters processing zinc ores or from the by-products of the combustion of certain coals. Isotopes: There are 30 known isotopes of germanium ranging from Ge-60 to Ge-89. There are five stable isotopes: Ge-70 (20.37% abundance), Ge-72 (27.31% abundance), Ge-73 (7.76% abundance), Ge-74 (36.73% abundance) and Ge-76 (7.83% abundance). Oxidation States: +4 is the most common. +1, +2 and -4 exist but are rare. Winkler's original name for germanium was Neptunium. Like germanium, the planet Neptune had recently been discovered from predictions from mathematical data. The discovery of germanium filled a spot predicted by Mendeleev's periodic table. Germanium took the place of the placeholder element eka-silicon. Mendeleev predicted eka-silicon's physical properties based on its position in the periodic table. He said its atomic mass would be 72.64 (real value: 72.61), density would be 5.5 g/cm3 (real value: 5.32 g/cm3), high melting point (real value: 1210.6 K) and would have a gray appearance (real appearance: grayish-white). The closeness of germanium's physical properties to predicted values of eka-silicon were important to confirm Mendeleev's theories of periodicity. There was little use for germanium prior to the discovery of its semiconductor properties after World War II. Germanium production went from a few hundred kilograms per year to a hundred metric tonnes a year. Early semiconductor components were mostly made from germanium until ultra-pure silicon became available commercially in the late 1950s. The oxide of germanium (GeO2) is sometimes called germania. It is widely used in optical equipment and fiber optics. It is also used as a catalyst in the production of polyethylene terephthalate or PET plastic.